Grand Canyon University has a campus full of smart students and employees, but that wasn’t what attracted a horde of “zombies” this week. It was the inaugural Zombie Film Camp conducted by the GCU digital film and production program. Close to 70 middle school and high school students arrived on campus Monday for the weeklong camp to learn film techniques such as editing, screenwriting, camera operation, and prosthetics and special-effects creation that were applied to a final zombie-themed film. The completed thriller was shown at 11 a.m. Friday in the Ken Blanchard College of Business lecture hall. Students spent four days in workshops obtaining hands-on experience from GCU film instructors and industry professionals. Nine GCU film majors served as camp counselors for the students, who were divided into three groups and cycled between workshops. A short film was created by each group. The camp included basic meals and accommodations in one of GCU’s residence halls. 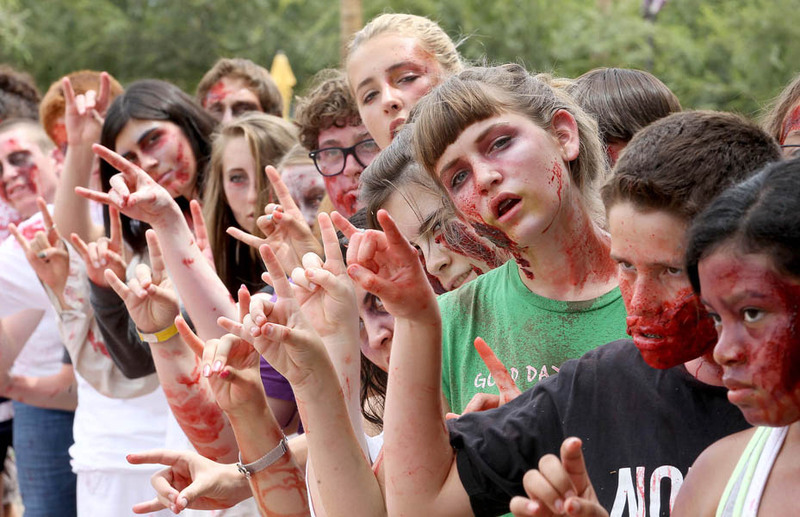 Even zombies, in their vacant state, are capable of learning to do ‘Lopes Up, as film campers discovered at GCU this week. Gregg Elder, GCU’s director of digital film, said that although the zombie theme was an attraction, the purpose of the camp was to give students the opportunity to learn from experience and have fun. “We taught them basic filming and camera techniques, but the point of the camp was the special effects,” said Elder, who has worked on more than 22 films and commercials and taught film at DePaul University in Chicago before joining GCU in 2006. The zombie pop-culture phenomenon has risen from the dead in recent years with the popularity of films, books, video games and TV shows featuring undead or apocalyptic themes, such as AMC’s hit series “The Walking Dead,” films such as “Zombie Land” and “28 Weeks Later,” and novels such as Max Brooks’ best-seller “World War Z,” along with a slew of zombie-themed video games. Society’s love for all things dead began in 1968 with George Romero’s film “Night of the Living Dead,” largely credited as the progenitor of the zombie genre. Zombies were seen as a popular representation of the turbulent social landscape of America in the ’60s. Popularity eventually died off as the turbulence settled, but the theme was reinvigorated in the early 2000s with the threat of terrorism and the prophesied end of the world. The zombie apocalypse theme resonates with fans as a representation of the fragility of modern society and an anxiety about globalization and societal collapse, as noted by author Bennett Sims in an article in The Washington Post. Zombies represent questions about consciousness and death and the desire to experience resilience of a small group amid worldwide chaos and disorder. Contemporary fears include the threat of nuclear war, a worldwide disease epidemic or an apocalypse. Zombies can stand for those fears in way that is terrifying and exciting. Camp participants admitted that the zombie theme initially drew them to the camp, but they said the learning experience exceeded expectations. Students had complete control of their work, including direction, cinematography, screenwriting, makeup application and acting. Tim Staudenmaier, 19, a recent graduate of Westview High School in Avondale, said he came to the camp with little camera experience but knew he wanted to major in film. He said the camp provided the opportunity to learn film techniques in an environment similar to a professional set. He will enter GCU’s film program this fall. Students also heard lectures on how to be successful filmmakers from guest speakers in the industry, such as Terrence Donnelly, who assisted with “The Exorcist” and “Revenge of the Nerds,” film producer Darrin Ramage and TV director and producer Paul Nemiroff. Will Westley, 24, a senior film major and camp counselor, said the camp provided a glimpse of what students will learn in the digital film program. He said it offered a unique opportunity to learn from seasoned college instructors while filming a fun and popular theme. “For some people who are (at camp), it is a preliminary activity for students to not only have fun and see zombies, but actually experience production,” Westley said. Reach Cooper Nelson at 639.7511 or cooper.nelson@gcu.edu. The screenings of the films produced during the Zombie Camp turned out great! We made a special trip to see their finished films on Friday and had a great time meeting some of the student film makers and their GCU mentors. They did a great job! Do we know where the movies are located for viewing?